Assange took refuge in the embassy in 2012 after he was released on bail in Britain while facing extradition to Sweden on assault allegations that have since been dropped. He refused to leave the embassy, fearing arrest and extradition to the U.S. for publishing classified military and diplomatic cables through WikiLeaks. Over the years, Assange used Ecuador’s embassy as a staging post to keep his name before the public, frequently making appearances on its tiny balcony, posing for pictures and reading statements. Even his cat became famous. Interior Minister Maria Paula Romo said Assange’s mental and physical health worsened while he was holed up, and he began to act out in aggressive ways including by smearing feces on the walls of the embassy. Hang that traitorous terrorist supporting woman attacker. He looks homeless… Oh wait, he is. Sorry i have a reflex of automatically disagreeing with any negative that the liberal press gives and it never proved me wrong. Sorry i have a reflex of automatically disagreeing with any narrative that the liberal press gives and it never proved me wrong. I have to agree with the gut-reaction from Resident Mortal. And it is evidenced by, example, ujm who seems to feel that a non-US-citizen like Julian Assange is a “traitor” (apparently meaning traitor to the U.S.) despite not only never being a U.S. citizen but not even on U.S. soil when allegedly he committed his alleged crime. The lefties don’t like this, do they! Snowdon the exiled traitor says “Images of Ecuador’s ambassador inviting the U.K.’s secret police into the embassy” but I don’t see any secret police. 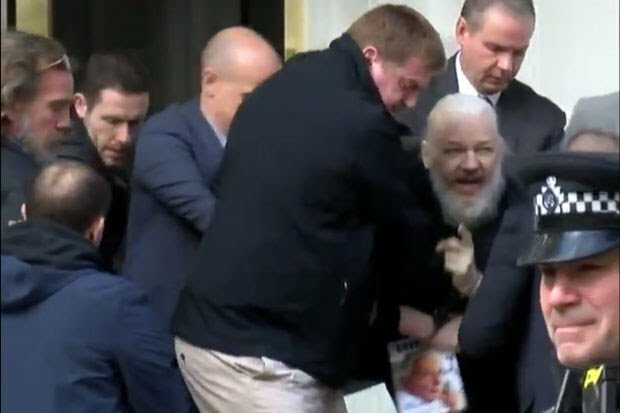 The widely published video of Assange’s removal from the Ecuadorian Embassy shows London policeman in all their glory removing a man who holed up in the Embassy for many years until his ever-patient hosts told him he was no longer welcome. Assange is accused of various crimes in different jurisdictions. Interesting that the same type of people who were ready to hang Supreme Court Justice Kavanaugh are all clamoring for this man’s release who was actively sought by the Swedish police on serious assault allegations relating to, you guessed it, women. His place is in jail until he is tried as his history of running away indicates he will do the same thing again if allowed a second’s freedom. End of story.